So I’m fast approaching the final stretch of preparation for Alexander Pope: A Search For Perfection. On Friday I suffered a bout of Popalysis, my head was so full of Popations that I couldn’t tell my Essay on Man from my Eloisa To Abelard. I was frozen, couldn’t settle on the next move the story had to make. But then I remembered “Hope springs eternal in the human breast” and I kept working. Sometime over the weekend I saw just enough of the road ahead to make the next move and, what do you know, I was writing again. Somehow I’d turned a dam into a flow. I knew that this would happen as that’s part of the process but it was a relief nonetheless! The next task, once the script is done, is to step away from it and use it as a starting point only because it’s all for nothing if I don’t get the story loose on my tongue. When that happens it really comes alive. I can tell the story. Without that all I can do is recite a script, which I won’t. Bring it on! 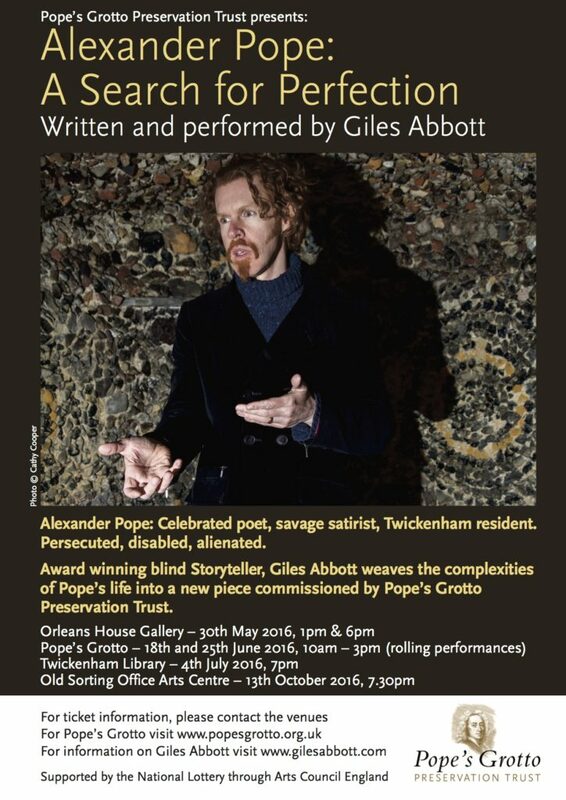 My first preview is on Saturday 21st May at The Proper Study of Mankind is Man: a symposium for Alexander Pope’s birthday hosted by Pope’s Grotto Preservation Trust at Pope’s actual Grotto in Twickenham (tickets still available here). To celebrate this moment (and Pope, of course), The Observer got in on the act. If you didn’t catch Vanessa Thorpe’s engrossing article in last Sunday’s edition, you can do so here. I’m excited! I love it when a script comes together! Plus we have the poster!